A large stock price run upset investors leading to a pullback following the retailer's latest quarterly report. Lululemon's (NASDAQ:LULU) stock plunged by 20% last month, according to data provided by S&P Global Market Intelligence. Shareholders remain in positive territory, though, with double-digit gains over both the last 12 months and year-to-date time periods. September's swoon came after the athletic apparel retailer posted solid quarterly results paired with an underwhelming forecast for the holiday season. Comparable-store sales rose by 3% in its fiscal third quarter, which was on par with the prior quarter's figure. It's encouraging for the business that Lululemon is posting any growth at all, given the tough selling environment for clothing retailers right now. Just as importantly, the company achieved higher profitability as gross profit margin improved to 48% of sales from 47% a year ago. This critical metric has been deteriorating for nearly four years, but may finally have found its bottom. "Our progress in the second quarter, especially in gross margin and inventory, marks the beginning of our recovery in profitability and sustainable long term growth," CEO Laurent Potdevin said in an earnings press release. 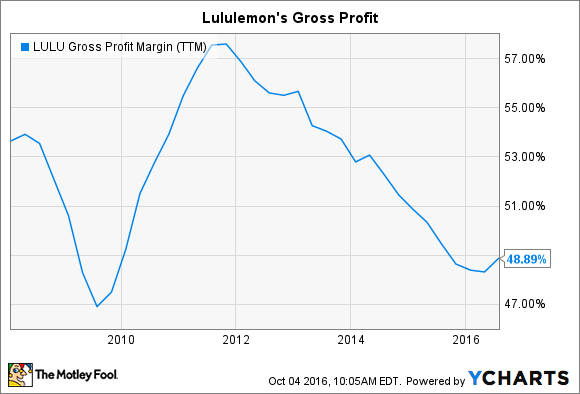 LULU Gross Profit Margin (TTM) data by YCharts. Investors apparently wanted to see a more bullish forecast from Potdevin and his executive team regarding the upcoming holiday shopping season, though. Lululemon raised its full-year sales outlook -- but only slightly. The company sees 2016 revenue at $2.3 billion compared to the $2.25 it had targeted three months back. Given that the stock had surged higher by 37% year-to-date headed into that quarterly announcement, it's no surprise that investors reacted harshly to the retailer's cautious growth outlook. 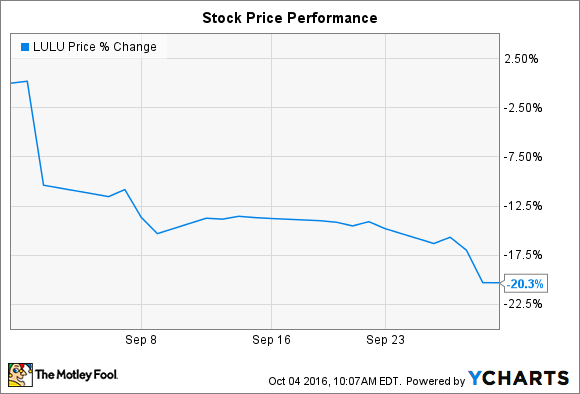 Short term price swings aside, Lululemon is enjoying solid operating trends heading into the busy fall season. In addition, continued discipline on pricing should yield more substantial profit gains in the coming quarters even if the overall industry bumps along at relatively weak growth.